If you’re looking for DIY Christmas Gifts or even just Dollar Store Christmas gift ideas, we’ve got the ultimate list! We’ve scoured the web to find the most interesting, unusual and wonderfully affordable homemade Christmas gifts. All of our ideas cost $20 or less! We’ve found ideas for all budgets and effort levels! My top three favorites are tucked away at the end of this article. These last minute DIY Christmas gifts cost less than $1! We’ve found a few ideas that cost $1 or less and take just minutes to put together. If you’re in a pinch, try these quick and easy DIY Christmas gifts! Emergency Chocolate is a quick and clever idea. Pick up your favorite chocolate bar and print out this quick and easy label from One Good Thing by Jillee. Tape it on your chocolate bar and you’re good to go! Festive Tic-Tacs are so simple! Just print these labels from Somewhat Simple and glue them onto a box of Tic Tacs. Turn white ones into Snowman Poop, red ones into Reindeer Noses, and my favorite Wintergreens into Christmas Tree Seeds. Nail polish is always a great option for the girls in your life! Bloom Designs offers a “For your Mistletoes” label that you can print out. Print it, grab some cute yarn or ribbon, and pick up a bottle of nail polish on your way. It doesn’t get more last-minute than that! Ornaments are cheap and easy homemade Christmas gifts! Of course, ornaments are a quick, easy and affordable gift. As Christmas time approaches, it’s easy to find these clear plastic globe ornaments for $1 or less at the Dollar Tree and Walmart. Fill them with glitter or paint or even hot cocoa ingredients for a fun and festive gift! Glitter Ornaments are a very basic holiday gift. It takes mere moments and they look so nice! Here’s some detailed instructions from Lee and Becky. Star wire ornaments are also easy and affordable! The most difficult part of assembling this ornaments is creating the template to wind the wire on! All you really need is a few pieces of soft jewelry-making wire that can be bent around the nail template. Get all the details from Alyssa and Carla! Snowman ornaments are super cute and easy to make! This Youtube video will give you step-by-step instructions for filing the clear round ornaments, drawing the face and attaching the hat. Although these instructions start at about the 4:51 mark, the entire video is full of fun ornament ideas that would make great DIY Christmas gifts! Hot cocoa mix ornaments also use those standard round ornaments. Instea dof filling them with paint, you can fill them with delicious holiday cocoa and other treats. Sprinkle Some Fun has so many ideas for ornament fillings – including soup mixes, dips, extracts, cookie mixes and more! Scrabble tile ornaments are easy to make with some letter squares and hot glue. The thrift stores near my home always have half-lost Scrabble games in abundance… or you can pick up some letter squares. They’re very cheap on eBay! There’s two ways to make these. You can combine words in this version from Oopsey Daisy or glue the letters on glitter snowflakes like this. Wooden clothespin snowflakes use eight clothespins and some wood stain to form a stunningly rustic ornament. These were designed by Stephanie Lynn and she provides detailed instructions on her website. Salt dough ornaments are a holiday tradition at our house! We invite all the cousins over, make a big batch of dough and break out the cookie cutters. You can’t go wrong with this simple three-ingredient recipe and some paint! Scrap Ribbon Tree ornaments are one of Melanie’s favorites! She left this suggestion in the comments during our giveaway contest and I absolutely love it. Can’t wait to try this idea from Fireflies and Mud Pies with the kids this year. Tea Light Snowman Ornaments are adorable and easier than they look! You’ll need a Sharpie, some ribbon and a pipe cleaner… and a battery-operated tea light, of course! Awfully cute for Dollar Tree decorations, right? You can repackage almost anything into a mason jar. When we surveyed our readers during our $25 Walmart giveaway, our audience spoke loud and clear. Star, Tiffany, Denise, Tina, Joanna and Deneva all described making homemade DIY Christmas gifts like these for their friends and family. We’ve found a few fun ways to decorate your jars and oodles of stuff you can put in them! Santa Belt Jars are easy DIY Christmas gifts. Dump some M&Ms or other seasonally-colored candies into a mason jar. Just add a small belt section and a ribbon! Katie at Little House of Four snagged a small belt section from a used purse but you should be able to find something usable at your local thrift store. Christmas Tree Jars take a little more work. Linda at Mason Jar Crafts Love provides a stencil you can print out and detailed instructions to help you paint these gorgeous jars. Fill them as she recommends, with epsom salts and tea lights, or with one of our other suggestions in the “homemade” section of this article! Fill your jars with homemade Christmas gifts with easy-to-make snacks! There are SO many options. We found many more than we could possibly list here… but here are some of my favorites. Hot Fudge is one of my very favorite things on this planet so I was very excited to find this recipe from Hoosier Homemade. Just a few simple ingredients combine to make something quite delicious! Each jar only costs about $3 – including the jar! Sugar scrubs are an excellent mason jar gift for those who are trying to avoid sweets. Sure, it’s sugary… but this time, it’s sweet for your skin! Some of my favorite sugar scrubs for homemade Christmas gifts are this Peppermint Candy Cane Sugar Scrub recipe from The Idea Room, this Homemade Eucalyptus Sugar Scrub from Salt Lick Lessons and Dr. Axe’s Homemade Sugar Scrub with Coconut, Honey and Orange. Stirring spoons are another great gift for the coffee or cocoa drinker in your life! These simple instructions from Mom Spark encourage you to invent your own combination of flavors from coatings and candies. Not fond of those? No problem! Here are a few more ideas we’ve found around the web – and believe me, there are loads more! Can’t decide on just one of these Christmas Gift Ideas? Make a themed basket! Themed baskets are awesome! Adjust these suggestions as necessary to fit the unique interests of your friend or loved one. The Dollar Store is a great place to stock up on many of these items! Assemble an art caddy! The Dollar Store offers these baskets and usually has a healthy supply of crayons, paints, coloring books, stickers and art supplies to fill them with. Cupcake Kits are fun for bakers! Find a cute box and add cupcake supplies, including sprinkles, cupcake liners and other Dollar Store finds! You can also print out images to tape to toothpicks for fun toppers. I love this gamer gift basket! The basket is filled with treats with fun labels by the Dating Divas. Use whatever treats and packaging you want… but don’t forget you can download the labels free on their website! Treat your friends or family to an Ice Cream Sundae Kit! Download free labels from Liz On Call… and I love that she packaged it in a drink holder from Sonic! Need other cheap Christmas basket ideas? Try these! Stuff winter gloves with hot cocoa, hand warmers and snacks! Fill slippers with various comfort items, including candy and pedicure products! Make a car wash basket with supplies and coupons for a free car wash! This is a great idea for kids to give their fathers! This Christmas cookie bundle is just a cookie mix and cookie cutter in a small oven mitt or hot pad! This list of ideas has a stuffed burger kit and more! These seasonal Dollar Tree decorations make great DIY Christmas Gifts, too! Cinnamon candles are an easy upcycling craft! Wrap a pillar candle with cinnamon sticks and some twine. It’s one of the easiest Dollar Tree decorations ever! Cookie cutter candles are another easy make. Instead of using a store-bought candle, you’ll need to melt wax and pour it into the cookie cutter. Before it solidifies, insert a wick. You can find this and other candle ideas from HGTV. No-sew heat packs are easy to make and so nice to use! Just be sure to use new socks – and I highly recommend some scented oil to offset the smell of warm rice. This North Pole uses a solar path light, a Styrofoam base, fake snow and some assorted craft supplies. Dollar Store Crafts estimated the total project cost about $5 and it looks so cute! Chalkboard signs are so popular – and they’re so easy to make! The most affordable way to make one is to find a cheap framed mirror or painting at a thrift store and fill it in with chalkboard paint. The Frugal Homemaker provides detailed instructions on their site! #3… This snow day survival kit is an excellent DIY Christmas gift! The basket features chocolate spoons, hot cocoa mix and a dry sugar cookie mix with a festive cookie cutter. Christina (The DIY Mommy) even provides free labels to print for your containers! #2… I also love this faux gumball machine! How adorable is this?! You can easily paint it in Christmas colors or fill it with Christmas candy if if you want it to be more festive for the upcoming holiday. You can find a tutorial for a similar item here. #1… This fish bowl snowman is my absolute favorite thing on this list. It’s absolutely stunning! Although the original by Smart School House was made with items from Michael’s, I’ve seen all of these items at the Dollar Tree. This is hands-down one of the best Dollar Tree decorations I’ve ever seen. Thanks for checking out our list! I always make baked goods for people… Who doesn’t love a good home baked pie, cake or cookies??? It’s affordable and doesn’t break my bank as I always buy baking supplies in bulk. Then I go to Dollar Tree and get the pretty boxes to put them in. Thanks, Star! I love the idea of going to Dollar Tree for pretty boxes. That’s genius! Here is the easiest wreath…ever! Go to Dollar Store and buy a set of ornament balls. Find a wire hanger and bend it into a circle (you know…like a wreath). Uncurl the hook end to open it, but leave it so you can curl it back together to close. Add the ornaments to the wire one at a time using the loop that comes on the balls. Stagger them as you wish to fill up the wire. Close the wire and add a bow (you can find a fancy one at the Dollar Store). Done! I’ve done jar gifts, you put either got chocolate or a backing item in it and put a bow on it an bam a gift. My kids and I make salt clay ornaments, the older they get the more elaborate the ornaments get. (Pinspiration!) Its cheap and you can make anything you can imagine! Baked goods is a great gift DIY. 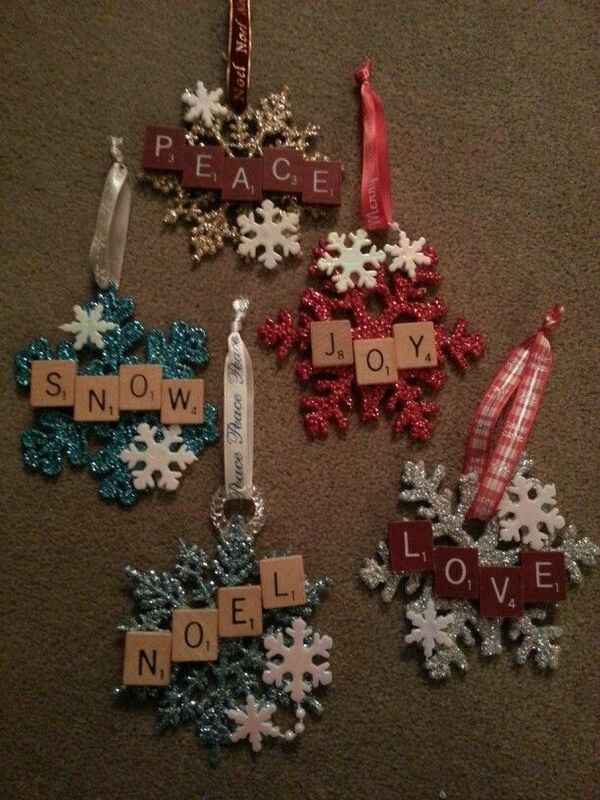 We always sit down and make our own ornaments, and personalize them with the year. We also enjoy making garland out of popcorn, or paper shapes…. I love to crochet and have taught myself everything I know. One year I made snowflakes and then made my own mix to stiffen the material so the ornaments wouldn’t curl into themselves. Just a little Elmer’s glue and water then lay them flat to dry. I learned the crochet pattern from a YouTube video. I love homemade gifts better than anything store bought. This year we made lots of sugar scrubs. Sugar, olive oil, food coloring and essential oils to make it smell yummy. We used jars and containers and had a blast. Frugal spending is but always easy- coupons, making gifts, are the simple things in life. I love making different bundles from Dollar tree…for movie goers I do 3 boxes of candy and a box of popcorn with a Redbox code for free movie rental, bakers I get spoons, measuring cups and mixes with a copy of a recipe and for the glamour girls I put together a makeup holder with makeup,polishes,brushes ect. I do hygiene ones for the homeless shelter also. I am poor so most Christmas ppl’s don’t get Christmas gift from me but last year I made homemade cookies an gave them. Hi, Angela! We’re always happy to help. What county do you live in? I get old picture frames from the thrift store (or dollar store). TAke the glass out of the frame. Then paint a very simple snowman or nativity on the glass. Let it dry and put it paintside in- back into the frame. I get dollar store hot pads from the dollar store (2/$1) and have my kiddo draw a Christmas picture on the back. Great gifts and several family members enjoy seeing how the art grows up a bit each year. We love the gift some knitted washcloths or cinnamon rolls from the pioneer woman or something with essential oils like deodorant or body scrub or espín salt for the bath. Hi there, for my fiancé I always have the kids make some craft on a small canvas. It is always made with a hand or their foot print. He loves them! One year my sons foot was a rocket ship and we had the phrase “I love you to the moon and back” my daughter did her foot prints and we made them into a butterfly. Then, I had her use fingerprints to decorate the wings. Sometimes the dollar tree has the canvases, Walmart has them at a good price. Acrylic paint cost 50 cents. You can buy yellow red and blue and create any color you want. I hope this helps someone out. There is a lot of jabs and footprint ideas on Pintrest too! I save the glass jars from pasta, pickles things like that. Take off all labels and wash and dry well. For Christmas, birthdays or any gift I fill them with candies, homemade cocoa mix, the dry ingredients for cookies and even homemade body scrubs. Possibilities are only limited by your imagination and Google! You can add ribbons, raffia or yarn here or add a circle of any fabric, tulle, even brown paper bag over the lid secure with a rubber band and then add the ribbon, raffia or yarn. You can also add any little bells, ornaments or beads. Top it off with a little tag with any directions and personal message. There you go. As a single mom of 5, I always try to repurpose all I can. Happy crafting. I make candy cane reindeer. Twist colored pipe cleaners around the top of the crook and make antlers, glue on googly eyes on the front of the crook and then below them glue on fuzzy different size and color balls and there you have them!